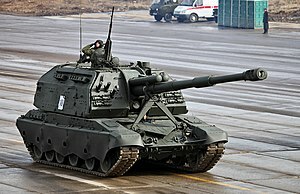 The 2S19 "Msta-S" (Russian: Мста, after the Msta River) is a 152.4 mm self-propelled howitzer designed by Russia/Soviet Union, which entered service in 1989 as the successor to the 2S3 Akatsiya. The vehicle is based on the T-80 tank hull, but is powered by the T-72's diesel engine. Development of the 2S19 started in 1980 under the project name Ferma. The prototype was known as Ob'yekt 316. The 2S19's standard equipment consists of a semi-automatic laying system 1P22, an automatic loader, an NBC protection system, passive night vision device for the driver, a wading kit, a dozer blade, a smoke generator and 81mm smoke launchers, 1V116 intercom system and a 16 kW generator AP-18D. In 2008 the Russian armed forces ordered an improved model with an automated fire control system. The 2A64 ordnance of the 2S19 can fire the following types of ammunition, among others: HE (24.7 km), HEAT-FS, HE-BB (28.9 km), HERA (36 km), smoke, chemical, tactical nuclear, illumination and cargo (ICM). [original research?] The laser-guided round “Krasnopol” (of the 9K25 system) can also be launched, as well as the shorter "Krasnopol-M” which fits into the automatic loader. Msta-S howitzers were used by Russian Army to deliver artillery strikes against Chechen separatists during the Second Chechen War. Msta-S howitzers have also been used in the War in Donbass by the Ukrainian Army as well as pro-Russian separatists who captured one machine during the conflict. Russia - 550 2S19 and 2S19M1, 108 2S19M2 since 2014. 42 2S19M2 on order since 2016. Deliveries of Msta-SMs are underway and several dozens have been delivered. Morocco - Received an undisclosed number of Msta-S.
152 mm howitzer 2A65 - a towed version of the same gun. 2S33 "Msta-SM" - Improved version. Prototype. 2S19M2 "Msta-SM2" (2013) - Improved version currently in production equipped with a new automatic fire control system which increases the rate of fire. Digital electronic maps are now available which significantly speeds up the terrain orientation in difficult geographical conditions and allows performing faster and more efficiently firing missions. 2S19M1-155 (2006) - 155mm export version of the 2S19M1, fitted with an L/52 gun with a range of 40+ km. 2S30 "Iset" - Improved version, prototype only. 2S35 "Koalitsiya-SV" - Project for a new artillery system for the Russian land forces (SV = sukhoputniye voyska). Early prototypes consisted of a 2S19 chassis with modified turret, fitted with an over-and-under dual autoloaded 152mm howitzer. Development of this variant was abandoned in favour of an entirely new artillery system using the same designation. ^ Pashin, Alexander. "Russian Army Operations and Weaponry During Second Military Campaign in Chechnya". Moscow Defense Review. Archived from the original on January 29, 2009. Retrieved 8 March 2014. ^ Ferguson, Jonathan; Jenzen-Jones, N.R. (2014). "Raising Red Flags: An Examination of Arms & Munitions in the Ongoing Conflict in Ukraine. (Research Report No. 3)" (PDF). ARES. Archived (PDF) from the original on 1 December 2014. Retrieved 4 February 2015. ^ John Pike. "Belarus Army Equipment". Archived from the original on 16 February 2017. Retrieved 23 December 2014. ^ "SIPRI Arms Transfers Database". sipri.org. Stockholm International Peace Research Institute. Archived from the original on 2014-12-16. Retrieved 2013-03-23. ^ "Georgia Georgian army land ground armed forces military equipment armoured armored vehicle UK - Army Recognition". Archived from the original on 15 April 2015. Retrieved 23 December 2014. ^ "Lenta.ru: Наука и техника: Военные в Чечне получили новые самоходные гаубицы". Archived from the original on 19 October 2014. Retrieved 23 December 2014. 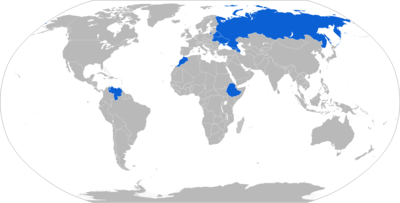 ^ "TASS: Russia - Russia's annual arms supply plans 30-70% fulfilled — defense official". TASS. Archived from the original on 16 November 2014. Retrieved 23 December 2014. ^ John Pike. "Russian Army Equipment". Archived from the original on 26 June 2012. Retrieved 23 December 2014. ^ "Firsts modernized self-propelled artillery howitzer 2S19M2 enter in service with the Russian army". June 28, 2013. Archived from the original on September 23, 2015. ^ "ria.ru Forces". Archived from the original on 2016-09-20. Retrieved 2016-09-08. ^ "ЦАМТО / Новости / Юрий Борисов: Минобороны в ходе форума «Армия-2016» заключило контракты на 130 млрд. рублей". www.armstrade.org. Archived from the original on 16 August 2017. Retrieved 24 April 2018. ^ Sputnik. "Russia's UVZ Corporation to Deliver 42 Self-Propelled Artillery by 2019". sputniknews.com. Archived from the original on 17 September 2016. Retrieved 24 April 2018. ^ "ЦАМТО / Новости / Новые самоходные гаубицы поступили на вооружение в тяжелую мотострелковую бригаду, дислоцированную в Оренбуржье". www.armstrade.org. Archived from the original on 16 August 2017. Retrieved 24 April 2018. ^ "ЦАМТО / Новости / Главком Сухопутных войск сообщил о поступлении новых вооружений". www.armstrade.org. Archived from the original on 14 December 2017. Retrieved 24 April 2018. ^ joffrey. "Russian 1st Guards units receives 2S19M2 howitzers 81606171 - June 2017 Global Defense Security news industry - Defense Security global news industry army 2017 - Archive News year". www.armyrecognition.com. Archived from the original on 24 August 2017. Retrieved 24 April 2018. ^ ngain. "Russian Central Military District receives 'dozen' of new Msta-S self-propelled howitzers 22906172 - June 2017 Global Defense Security news industry - Defense Security global news industry army 2017 - Archive News year". www.armyrecognition.com. Archived from the original on 24 August 2017. Retrieved 24 April 2018. ^ "ЦАМТО / Новости / В учебный центр ВВО в Забайкалье поступили модернизированные самоходные гаубицы «Мста-С»". armstrade.org. Archived from the original on 4 October 2017. Retrieved 24 April 2018. ^ "New artillery brigade of Combined Arms Army receives modified Msta-S howitzers, Western MD : Ministry of Defence of the Russian Federation". eng.mil.ru. Archived from the original on 5 December 2017. Retrieved 24 April 2018. ^ "ЦАМТО / Новости / На вооружение общевойсковой армии ЮВО на Северном Кавказе поступили усовершенствованные САУ «Мста-С»". www.armstrade.org. Archived from the original on 30 January 2018. Retrieved 24 April 2018. ^ "New artillery systems fielded near Volgograd, Southern Military District : Ministry of Defence of the Russian Federation". eng.mil.ru. Archived from the original on 28 February 2018. Retrieved 24 April 2018. ^ John Pike. "Ground Forces Equipment - Ukraine". Archived from the original on 7 July 2017. Retrieved 23 December 2014. ^ "Nuevo lote de obuses autopropulsados 2s19 MSTA-S de 152mm arribó a Venezuela - maquina-de-combate.com". Archived from the original on 19 October 2014. Retrieved 23 December 2014. ^ Russia has delivered to Morocco a batch of Msta-S self-propelled howitzers. "Russia might offer non-nuclear submarine to Morocco". TASS. July 4, 2013. Retrieved July 5, 2013. ^ de Larrinaga, Nicholas (22 April 2015). "New Russian heavy armour breaks cover". IHS Jane's Defence Weekly. Archived from the original on 21 April 2016. Retrieved 25 November 2015. Wikimedia Commons has media related to 2S19 Msta-S.
152-mm Self-propelled Howitzer 2S19 "MSTA-S"